American Airlines has myriad aircraft in different configurations from legacy American Airlines decisions before the merger and from US Airways, and a series of individual decisions along the way. Customers can luck out with better aircraft for passenger experience and worse aircraft. Having different configurations is necessary for different missions. They want a different product for the New York JFK – Los Angeles/San Francisco market than for other domestic routes. As a result the Airbus A321s that fly cross country have lie flat seats, the A321s that fly in other markets don’t. But the more different configurations they have the more complicated their operation. Two years ago they sent the wrong type of plane to Hawaii by mistake. Swapping aircraft gets complicated for accommodating passengers too when they have different seat counts. Changing aircraft on a full flight to a plane with fewer seats can get very very expensive. And different configurations means the airline can’t use their fleet as efficiently. US Airways management has long believed in standardization when it can be accomplished at low cost. That’s why the US Airways Shuttle introduced first class — not because they were looking to sell first class on the route, but because it meant they no longer needed a dedicated fleet of planes just for the shuttle. American is also working to standardize its fleet as much as it can. The new Boeing 737 MAX interior is going to become the standard for their full 737 fleet, and both legacy American and US Airways Airbus A321s are being standardized with a similar new dense cabin with high speed internet and power at each seat but no seat back video. The 300ER was probably the best passenger experience in the fleet. It used Zodiac reverse herringbone business class seats similar to Cathay Pacific’s and EVA Air’s and Main Cabin Extra economy seats with extra legroom were only nine across instead of ten across. The 300ERs are being reconfigured to add premium economy seats and densify coach eliminating the dedicated Main Cabin Extra section at the front of coach and adding seats across. As part of this standardization project they’re going to eliminate the subfleet of Boeing 777-200s with 45 business class seats. American Airlines has 47 Boeing 777-200s. All planes that are in service have new fully flat business class seats with direct aisle access. 13 aircraft have 45 of the the Zodiac ‘Concept D’ seats and 215 coach seats. (It also still has Main Cabin Extra seats with more legroom in a 9-across configuration, and some of standard economy too.) This was the planned legacy American Airlines configuration. After US Airways management took over they decided on a ‘dense’ configuration (more seats, just 37 business class seats) but they didn’t go back and retrofit the 13 777-200s that had already been given 45 business class seats. 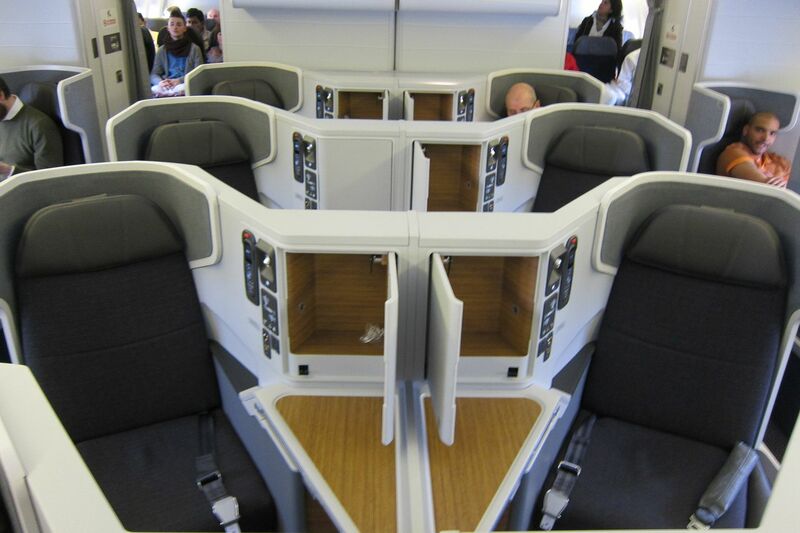 And when they dropped Zodiac as a seat supplier they didn’t go back and change to the newer business class seats. As recently as August American told me that as they retrofit all their Boeing 777-200s to offer premium economy that the subfleet of 13 planes with 45 business class seats would keep all of those business class seats. That’s changed. [O]ver the next few months we’ll begin converting the 13 aircraft with 45 business class seats to the same version as the 772s with 37 business class seats. This will make all our 772s the same and support our operation in running efficiently especially in times of irrops. Now I actually like the Concept D seat, although many customers don’t like the forward-backward facing arrangement. I do like the Super Diamond seat that’s on many 777-200s and on Boeing 787-9s more. They’re retrofitting the plane but not standardizing to the better seat (seats are expensive). And fewer business seats is never desirable. I understand the desire to eliminate the subfleet for operational reasons. I just wish it was with more business class seats! Interesting how there’s a clear distinction between Delta, who clearly wants people to pay for the seats they sit in (they will be going to just 28 seats on their 772s when they add Premium Economy) and United, who continues to have large business class cabins and likely a greater chance of upgrades clearing. Going from Great to Good! Agreed on the Zodiac seat. In some ways, it’s much more private than the Super Diamond. It’s a very comfortable seat, and I’m sure AA is also still fixing the “motion” issues with connected seats. Not sure the bean counters got this one right. As I understood it, much of the 45 seat J sub-fleet was dedicated to LHR where AA was able to sell many of those seats. It seems very shortsighted to throw away that kind of revenue opportunity for effectively – PE revenue. While they remove the seats, can they FIX THE REST OF THEM? I have flown on both configurations of AA’s 777-200 and I must say The Concept D seat is a sub par experience from The Super Diamond seat. If the idea is standardization, why not eliminate The Concept D seat altogether and replace it to consistently match the rest of the fleet? It seems like AA is committed to the idea of standirdization by ripping out all the IFE and adding more seats on their domestic fleet, and spending tons of money to do it. In this case of the business class seats, it seems like AA is putting a band-aid over a wound instead of properly treating it. I believe this is another example of management not truly caring about providing the best experience for their customers. AA cares quite little for standardization. That’s a pipe dream. UA has, what, 2 different varieties of J seats? And DL has 2? Why would anyone want to fly in the US? Loyalty is done…stay away form any kind of loyal flying. As you keep spending money, they will keep profiting and making the product worse. They don’t listen. Why don’t they add business class seats to standardize the planes with less instead? Money that’s why. UA has 3 and DL has 5… DL also has 4 different 767 configurations. Anyone fly in the US? Simple because it’s faster then taking a train cross country. This is the continuation of ruining the good (past) about AA and bringing the bad from US Air.